Puthia is a culturally rich sub-district (Upazila) of the Rajshahi District in Bangladesh. The largest number of historically significant Hindu structures in Bangladesh is found in Puthia. Many of these structures are well preserved and Puthia is an interesting area for tourists to explore and gain insight into the history and culture of Bangladesh. A charming small temple to visit here is the Jagannath temple, also known as the Roth temple. This Bangla-style miniature temple known as the Jagannath Temple is situated adjacent to the large Bhubaneshwar Shiva Temple overlooking the big pond named Shiv Sagar. It is built out of brick, resembling the shape of a Bengali bamboo hut, with a single tapering tower. The Jagannath temple of Puthia measures only 5m (16ft) on each side. The single tapering tower rises to a height of 10m (33ft). Its western facade is adorned with terracotta panels of geometric design. The temple is octagonal in design and has a corridor surrounding it with 8 pillars. There are two entrance in the north and east side to enter the temple. The entrances has nice decorations on basalt stone frames. This temple is believed to be built by Rani Bhubanmoyi Debi in 1830 AD. It is currently abandoned. Check out here to know more about Puthia and it’s amazing structures: Puthia – An amazing village in Bangladesh full of beautiful temples. Have you ever been to Puthia and visited the Jagannath temple? How amazing you’ve found it? Share your thoughts and experience with us in comments. Any question about visiting Jagannath Temple of Puthia? Ask us here! Consider sharing it in social media so that more travelers can know about this beautiful country which is little known to everyone. 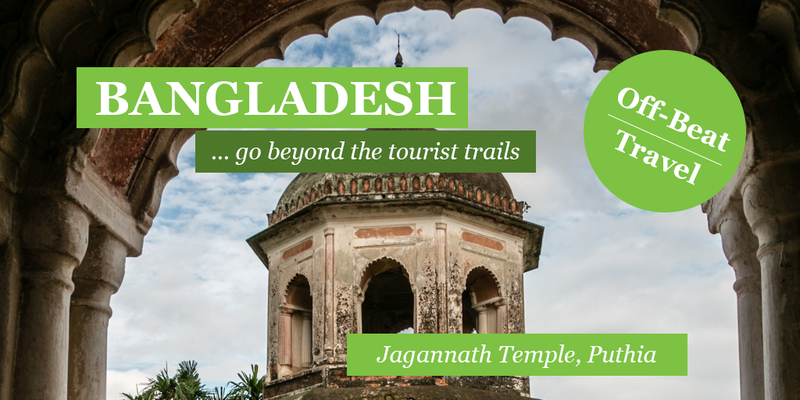 Check out our archaeological tours in Bangladesh to visit the most impressive archaeological sites including Jagannath Temple of Puthia, and our Bangladesh tour packages and holiday packages in Bangladesh to visit Bangladesh with comfort.